2. Turn the fabric to the wrong side and spread glue along the back of the cotton fabric. Allow to completely dry. This will keep the fabric together and it will not fray. 3. Trace the pattern to the fabric to the wrong side of the fabric, or over the glue with a pencil. Having a circle template helps keep the pattern centered and the circle round. 4. The sample uses the handles in their original form, but they can be painted and lacquered (nail polish, acrylic paints with spray sealer) or gilded or stained a different color. Use your imagination. 5. Glue the handle to the purse fabric on the wrong side, following the diagram. 6. Clip the curves showing inside the handle, and glue them over to the wrong side or inside of the purse. 7. Complete both handles the same way. 8. With a small amount of glue on the edges, place the purses together wrong side to wrong side. Allow to dry. 9. Place a small amount of glue along the outside edge and cover the edge with a silk thread, or small braid. (I used a twisted silk thread.) Trim away excess at the handles and you have a purse that opens and closes. 10.Place a hankie edge sticking out for more character. The suit of dotted Swiss is lined in pink Swiss batiste is most becoming on Emilie Claire. Emilie Claire is ready for her trip. The porter has taken her trunks and she waits with her personal items for the call to board the train, Lisabeth’s doll safely in her arms. If you have reviewed the pattern for the original doll, you will see I have changed her jacket. It did not “suit” me. (Sorry I could not help it.) Emilie likes plainer clothes, more tailored and I made it to her wishes. The jacket is elegant in French ribbons and ribbon ties. I placed the purse as a belt purse as her hands are full. My hat arrived from the milliner yesterday. I was thrilled to open the box and see how special she made my bonnet. There is a sweet ruffle of lace added to the underside with a small bouquet of flowers peaking out. For my birthday, Father presented me with a new hatpin made with a real pearl. It is a treasure! We finally arrived at the time everyone has been anxiously waiting, the Convention Banquet. 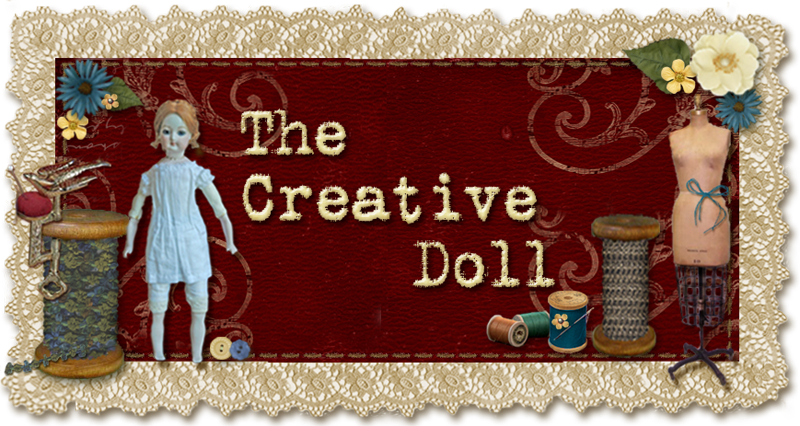 Each year a doll is created especially for the convention. How people are able to create this many dolls is extraordinary. Each one is a handmade beauty. When everyone arrives at the table we count heads, take tickets, and do a little tiny bit of convention business. My table mates and I share gifts for everyone at the table. (I’ll show you mine in another post.) Each gift is original and fun and really represents the giver in special ways. Perhaps it is a way to share a love of dolls, something representing your area or country, something made by you. It is all great fun to receive 10 separate gifts. It’s like Christmas. The program was a power point type of presentation with beautiful music, pictures of the people, places, and classes, luncheons of the entire week; a retrospective of dolls, where they started, where they are today and all those in between. The show was nostalgic, emotional and well done. I enjoyed it immensely. Okay, now I get to say it, the food was GREAT! Dinner was all about fillet and vegetables and potatoes. The convention doll, Grace, which you see in the photos, was created by an extraordinary artist, Beverly Walter. Beverly began her career in doll making in 1969. She creates one-of-a-kind period ladies. Each piece of porcelain artistry is a combination of porcelain sculptures, add-ons and multiple china paint firings. Her pieces have semi-precious stones applied. The costuming, completed by well known dressmakers, is period correct, meticulously sewn and embellished. I took so many pictures of her work at the special exhibit; I hope to share them with you in future posts. There is one really serendipitous moment in all of this that I must tell you. I arrived at the special exhibit for my appointed time to photograph and was stopped in my tracks at the beauty of the dolls before me. I started taking pictures like crazy. I could not believe what I was seeing. While photographing I stopped at this small doll, always my favorites, and stared, appreciating all her little details. Her clothing was perfection. She had a chemise a la Reine (the peasant dress style of Marie Antoinette), she was dressed in a Robe a La Francaise, an additional court costume was placed on a mannequin and a wonderful little lace mantle was created for her. I enjoyed at her for a long time. Another thing I noticed is that I had somehow picked out and purchased or even had in my stash at home the same fabrics as this wonderful little wardrobe. Thus ends my story of the convention. But there is more to tell you and more to show and more inspiration coming. So, hang with us and we will find more things to inspire you. Thank you for all your comments. Having completed my class for Mary, I was able to excuse myself and run to stand in line for the luncheon entitled “Girl with a Pearl Earring. Of course we all were wondering about the program and what the souvenir would be. The doll club of Vermont (if this was New Hampshire I will scream as I did not take notes) did the best job at our table favors, prizes (they had something for every person there) and the overall program. My first lunch was proving a delight. And lest you think I like everything I eat and do not complain, that is not so. The sandwich plates were very good, but I was saving myself for some pecan pie. We were in Georgia, right? But, they said they RAN OUT! What! So we got a lemon curd with a raspberry and some whipped cream instead. I like lemon in my tea and, of course, my lemonade, but I am not a fan of lemon pies, lemon bars, lemon tarts, lemon drizzle or icing and other concoctions. At least I got to save those calories. There is a positive. The room was so cold, it made the luncheon uncomfortable. AND I HAD A SWEATER! My poor friend in her sleeveless tank-type dress was positively turning blue. The speaker was informative talking about the Dutch dolls in painting and in history, really interesting subject. Door prizes were given out and I thought I would get lucky and win a wooden shoe, some were antique, but my ticket number was called and I won a wonderful little doll dress with beautiful smocking on it. I was informed it would fit the doll from the luncheon. Oh, Goody! As the program drew to a close and we shook so badly from the cold, we were at last given our darling little girls from the Boneka Company. (http://homepage.mac.com/boneka/Menu10.html) She is a Dianna Effner sculpt especially for them. My little girl came with a tag, her name is Grietje, (after the character in the movie) and she is Edition 103 / 145. I took the net off her head to release her curls and you can see her here in her darling regional and period costume. She arrived in an unbleached cotton bag; a lovely souvenir for the event. (For a few dollars more I could have purchased her boy – friend. But then we would have to discuss the budget again. And I didn’t want to blow all my good works. I was on a waiting list for Mary Zoch’s Wigging Class. (I borrowed the prototype picture, too!) If you have not taken a Mary Zoch class before, you should. She’s wonderful as a teacher, informative, patient and encouraging. Mary allows students to progress at their own speed and also allows them to create whatever they want. This was no different. I loved the class as I learned the techniques and products, but did not have to make a little girl wig. She had prepared the wigging materials and curls for us in advance, so mostly we learned what to do, how to do it, and then were allowed to style the hair our own way. This made the class remarkably fast and I was able to finish. Yea! For me there is nothing worse than taking home another unfinished project. I have enough of those I created without adding more. You do, too. You know who you are. You don’t have to be in a club to be a member of the UFDC. Did you know that? I didn’t at first. You can enroll as a Member at Large. (My friends and I call ourselves the MALcontents!) We meet once a month at Barbara’s house and play dolls and work on projects. We are not large enough to be a club, but we do the outings and shows and things of interest to us. It is fun and relaxing. So, on Thursday, while those who are members did the annual meeting (and yes anyone can go) I stayed in my room and worked on sewing, reading, resting and playing with my fabrics. At lunchtime I met a friend from dinner on an earlier occasion and we went next door to a traveling exhibit of poster art. The subject of the exhibit was political statements regarding war, racism and the environment. Oi! (I picked that up from Harry Potter.) How depressing. What a waste of $8.00. Well made points in some of them, but really, I was on a nice vacation and had not been away from my house in two years. I was running from depression and didn’t need it here. I know I need to be socially aware, but this was in your face. To get over it we went to the shopping center food mall and had a “cheap” lunch. And I knew it all afternoon. TMI? When we finished I was back up to the room and having a go at finishing my Saque du Voyage. (Yes the one I ran out of thread on and am currently trying to finish. I bought the thread.) And I took a nap. I volunteered to be a monitor for the competition room. That was a learning experience, loved it. I got to sit in front of the Dorothy Heizer display. Yes, it was torture to examine some of the work of a modern day artist, who has sadly passed, and learn as much as I could in the 3 ½ hours I was there. I did take pictures and are sharing them today. I had the opportunity to HOLD one a few years back when I was taking a class from George Stuart who has one in his collection. I am jealous. I will be sharing some of the pictures I took along the way of this blog. There were too many to share with you today. Friday was going to be a busy day so I returned for more reading and squishing into my comfy bed.